The English language, according to Wikipedia, is the third-most-common native language in the world after Mandarin Chinese and Spanish and is the most widely learned second language. Not only is it widely used in technology and entertainment, it is also an official language of the European Union, many British Commonwealth countries and the United Nations, as well as in many international organizations. The U.S. Department of State recognizes that promoting the learning and teaching of English as a foreign or second language both within the United States and around the world is an essential step towards increasing cultural understanding between the people of the U.S. and other countries. The Department of State created the Office of English Language Programs, under the Bureau of Educational and Cultural Affairs, to encourage English language education for non-native English speakers. “As a former Business English professor for Spanish Masters of Marketing graduate students in Spain and a volunteer tutor for young Hispanic ESL (English as a Second Language) students in the United States, I had a hard time finding resources for my students or connecting with other teachers with whom I could exchange best practices and ideas for lesson plans that took into account the cultural differences of non-native speakers,” says Michele Bartram, Government Book Talk Editor and Promotions and Ecommerce Manager for GPO’s U.S. Government Online Bookstore. Fortunately, the State Department’s Office of English Language Programs publishes the English Teaching Forum, a quarterly journal that serves as a resource for professionals teaching English as a foreign or second language all over the globe. This publication connects teachers of English as a second language across the many countries in which they are teaching by allowing them to submit articles and share their experiences working towards their common goal of helping others learn the English language worldwide. In fact, the majority of articles featured in the English Teaching Forum are authored by English language classroom teachers. Each new issue of the journal has a distribution of over 85,000 copies across more than 130 countries! Teachers of English as a second language will find a number of useful articles in the pages of the English Teaching Forum. Topics covered in this quarterly publication include classroom language learning activities, teaching methods and tools, informational articles on potential teaching topics related to American culture, and understanding the needs of the diverse group of students that these teachers encounter. In the most recent issue of the English Teaching Forum (Volume 51, Number 4, 2013), “Raising Cultural Awareness in the English Language Classroom” tackles the question of how to introduce American sociocultural elements into the language curriculum to enhance the students’ ability to grasp the cultural nuances of the language. It has been said that students cannot master a foreign language without understanding the cultural context in which the language is spoken, and in this article, author Jerrold Frank explores this theory and suggests methods of introducing cultural lessons to language students. Another particularly interesting feature from English Teaching Forum can be found in Volume 50, Number 1, 2012, in the article “A Call to Service” by William P. Ancker, which introduces an interview with Dr. James Alatis, a leader in the Teachers of English to Speakers of Other Languages (TESOL) community. The interview with Dr. Alatis, originally conducted in 2004 but reprinted in this issue in honor of the English Teaching Forum’s 50th anniversary, follows this introduction. 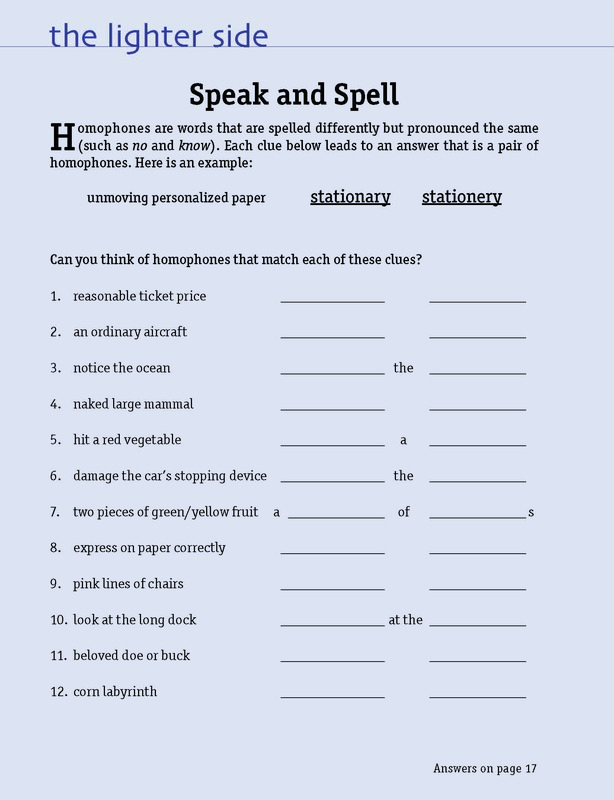 The journal even includes classroom exercises and printables, such as this fun quiz displaying the confusion caused by English-language homophones–words that are spelled differently but are pronounced similarly (like there and their). 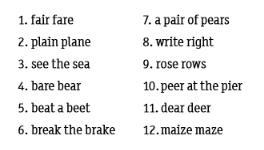 Image: Speak and Spell Quiz from English Teaching Forum 2012, Volume 50, Number 3. See answers at bottom of the post. 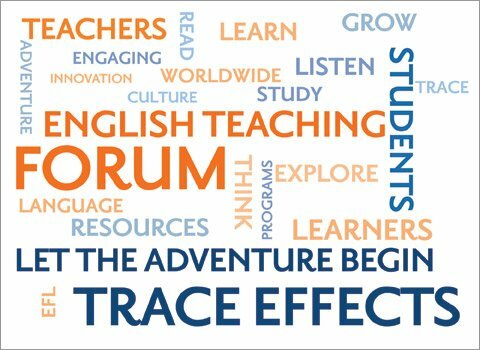 If you are a teacher or a student of English as a foreign or second language, or even if you just find language and learning to be topics of interest to you, the English Teaching Forum is a worthwhile publication to explore! For more resources for teachers of American English, visit the State Department’s American English website, including downloading their new American English Mobile App for both teachers and students. How do I subscribe to English Teaching Forum: A Journal for the Teacher of English Outside the United States? About the Authors: Stephanie Jaeger is Sales & Marketing Coordinator for GPO’s Sales & Marketing Division that markets GPO’s publishing services to the Federal sector. Government Book Talk Editor Michele Bartram is Promotions and Ecommerce Manager for GPO’s Publication and Information Sales Division in Washington, DC, and is responsible for online and offline marketing of the US Government Online Bookstore (http://bookstore.gpo.gov) and promoting Federal government content to the public.